The sub-standard condition of some housing for asylum seekers in Wales is "an accident waiting to happen", according to the Welsh Refugee Coalition. Problems seen by BBC Wales include broken fire alarms, leaking plumbing, damp, and broken electrical sockets. Clearsprings Ready Homes which provides all asylum accommodation in Wales declined to comment. The Home Office said it was committed to providing safe, secure housing. According to the latest statistics, there are 2,495 people in Wales currently seeking asylum. While their claims are being processed, they are not allowed to work but can receive somewhere to live. 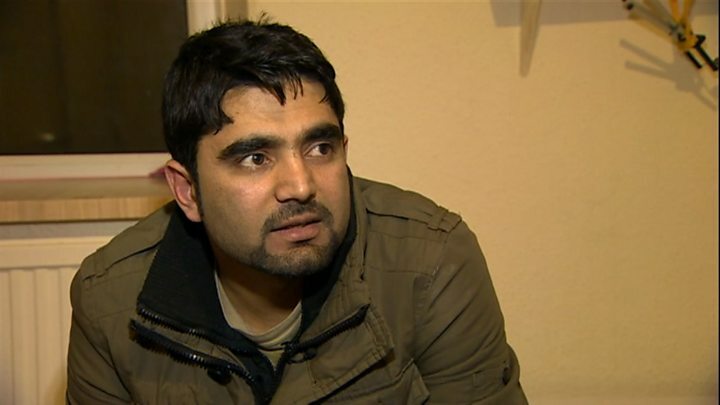 Sohail Ahmed, 25, who fled Pakistan in 2012, has been seeking asylum in the UK since June and has been housed in Cardiff for the past two months. BBC Wales' Sunday Politics programme visited where he lives and saw issues including a defective mains powered fire alarm, a window that did not close properly, damp carpets, a leaking kitchen sink and bath and broken furniture. Mr Ahmed said: "When I came here and then see all this situation, I call them [Clearsprings Ready Homes] many times, they are making promises but since that time nothing has happened. "At the end of the day we are still human. I'm standing here not only for myself. "I do believe that if I'm suffering hard from these things, there are many thousands of people who are suffering from these things." Clearsprings Ready Homes has a £119m contract with the UK government to provide all asylum accommodation in Wales. It is due to expire next year but the Home Office is considering an extension. 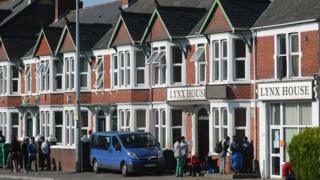 The company was criticised earlier this year over concerns about a policy which required people at its Lynx House centre in Cardiff to wear wristbands to allow them to get food. The bands were later scrapped. AM Bethan Jenkins, who is a member of the assembly's equality, local government and communities committee, which is conducting an inquiry into refugees and asylum seekers, said she was aware of the issues. "There are other families across Swansea, some of whom I've visited, who are experiencing the same things," the Plaid Cymru South Wales West AM said. "They're coming into houses that are very old, very damp, with numerous problems and really they should be fit for purpose before the asylum seekers are housed here." Speaking on behalf of the Welsh Refugee Coalition, Hayley Richards, said there had been problems with the quality of asylum housing in Wales for many years. "Asylum seekers are some of the most vulnerable people in our communities. And the standard of housing these people are expected to live in, you wouldn't see any other publicly funded housing in Wales of that condition," she said. "There are serious issues in terms of health and safety, so it's just an accident waiting to happen before something awful happens within asylum accommodation," she said. Clearsprings Ready Homes declined to comment but in a response to inquiries made by Ms Jenkins, the firm acknowledged that "clearly there is an issue that needs urgent investigation". A Home Office spokesperson said it was "committed to providing safe and secure accommodation" and if problems were not resolved by contractors it could impose sanctions. Sunday Politics Wales is on BBC One Wales at 11:00 GMT on Sunday 4 December.